It was a bright, sunny morning as we parked at the visitor and watersports centre in Coed y Paen near Pontypool and Usk, just a few miles north of Newport. Our walk was to follow ‘the Reservoir Trail’ which circumnavigates Llandegfedd reservoir. The route is possible because Welsh Water have made two sections of their land permissive paths; the remainder of the trail is public footpaths or roads. The reservoir was constructed after Cardiff Corporation was granted permission in 1958 and it was completed in 1968, covering 434acres it has a capacity of 5,300million gallons. Only 3% of the water is rainfall the remainder is pumped from the river Usk. Llangedfedd reservoir has been designated a Site of Special Scientific Interest (SSSI) for its importance to over-wintering wildfowl and because of this the reservoir is closed to all activities from 1st November to 1st March each year. Its northern edge has nationally important grasslands which are managed as hay meadows encouraging biodiversity. Flowering plants include several orchids and yellow rattle as well as orange foxtail grass and adders tongue fern. 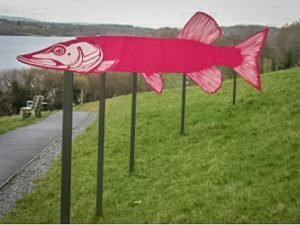 From the car park we followed the tarmac path down a steep slope to water level, passing 5 red pictures on posts, if you look through the viewing rectangle at the side of the path all these magically line up to produce a single image of a pike. The British record pike (46lb 13oz) was caught here in 1991. We crossed the dam enjoying the peace and quiet of the water in the morning sunshine (though we had to avoid some cars travelling towards us). At the far end of the dam we turned left and immediately climbed into the shade of woodland, where we spotted our first foxgloves of the season. After about 1km we passed a bird hide on the edge of the lake and then followed an inlet of the reservoir, which is a breeding ground for otters. We were not lucky enough to see any. 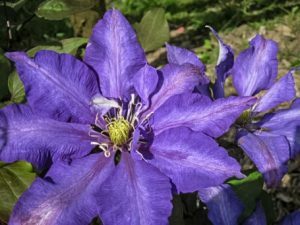 At the end of the inlet we turned north passing the entrance to Trostra Farm, their metal signpost drew admiration from all of us and gorgeous purple clematis in full bloom grew nearby. Continuing through woodland the men of the group helpfully held up a large fallen tree so that the rest of us could pass under it (in reality it was set in its location). Going through Twyn y Cryn woods, we came out at the top of a field. We stopped here for lunch, even though it was only just after noon, as there were good views of the reservoir and surrounding landscape. One sheep in the field showed a little interest in us but the rest continued grazing. Near Yew tree farm a late Bronze Age hoard (the Glascoed Hoard) was found and is on display at the National Museum of Wales in Cardiff. Soon after we passed another bird hide which is in the area that is closed in the winter. From here we continued south enjoying open views of the lake and spotting a fisherman wading in the water. There were stretches through woodland that were very muddy and slippery underfoot but it was dry in the more open ground. Woodlake Park golf course was on our left and a number of wooden seats were available for anyone wanting to relax. 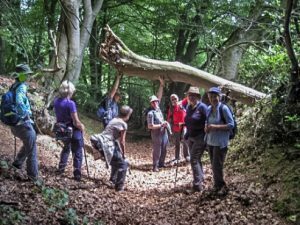 Despite the warm day, we arrived back at the visitor centre at 1.30pm – one of the earliest finishes for one of our walks, having walked just over 6 miles and climbed 650ft. This was partially down to the good quality of the paths but also the pace set by those in the lead! We took advantage of the refreshments on offer at the award winning centre. It was named ‘Welsh Building of the Year’ in 2016 by the Royal Society of Architects. This would be an excellent walk for anyone new to walking who wants to get out into the countryside, throughout the walk there are fingerposts directing you around the reservoir trail. Parking at the centre is free and the facilities very good. 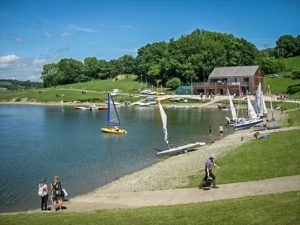 The area was bustling with families and people enjoying the many water sports available at the reservoir. Map152 or use walk leaflet no 7 ‘The Reservoir trail’ created by Llanbadoc Community Council.